The objective of this research project is to deeply investigate the problem of monitoring a dynamic phenomenon using a team of multiple mobile robots. The sensor-equipped robots will have the task of tracking and registering the phenomenon, and storing its evolution through a stream of data. In the system we envision, the robots will mutually localize themselves, autonomously control their own motion, and cooperatively perform the task at hand in an effective, reliable and safe manner. FireRS (acronym for wildFIRE Remote Sensing) aims to provide to fire managers and/or coordination centers a innovative tool for early detection and wildfire management via remote sensing improving the current state-of-art. 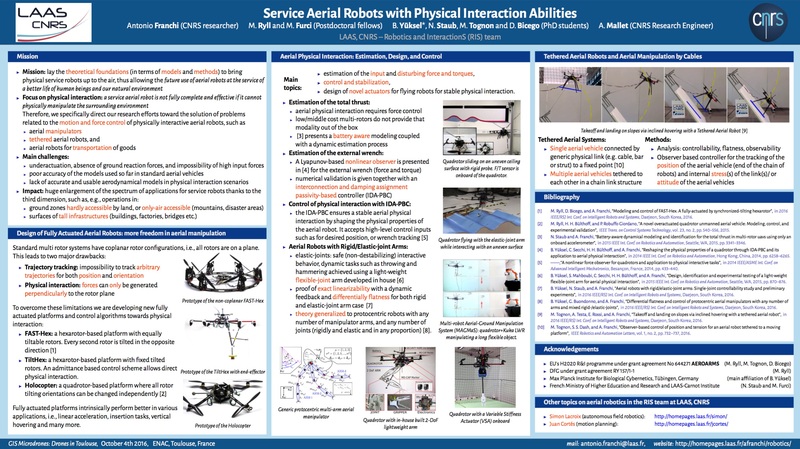 The ARCAS project proposes the development and experimental validation of the first cooperative free-flying robot system for assembly and structure construction.